With The Five Deadly Forex Mistakes DVD, Master Trader, Timon Rossolimos will help you: Place trades more easily, more quickly and more profitably with minimal risk and 100% confidence; reduce your losses and take money out of the market on a more consistent basis;stop trading on emotions (which is the fastest way to lose money);trade within your means; Cut out the surprises and shocks from trading the market by getting clued-up on the market that suits your trading personality best; make sure you’re not gambling with your money when you trade; boost your trading performance and exploit market volatility to the maximum. 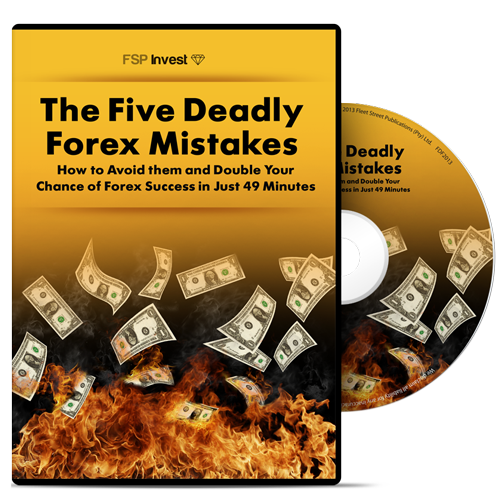 In short, The Five Deadly Forex Mistakes DVD will help you skip the expensive Forex learning curve and help you become the profitable Forex trader you want to be! The five deadly mistakes every Forex trader should avoid! You know the mines are there, but you don’t know where to step to avoid them. You see, when it comes to Forex trading anyone of these five deadly mistakes can destroy your portfolio. After trading Forex for four years, I have firsthand experience of how easy it is to make these five deadly mistakes without realising it and then sitting back and wondering why you’re losing money! Imagine you’ve just jumped out of a plane. Not knowing when to pull the ripcord on your parachute would be a ‘deadly mistake’! The same goes for trading! Even though the leopard knows it can out-run any animal, it patiently waits for an injured and vulnerable one so its chance of gaining a meal is higher. Just like a leopard knows it can outpace most animals, as a trader, you can take advantage of every possible trade at any time. The problems you’ll face, however, include the costs, emotions and all the movement in the market that make hunting a worthy trade so difficult. 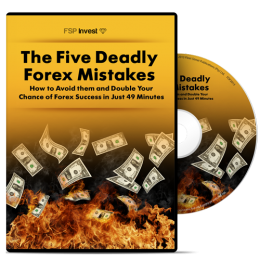 I guarantee The Five Deadly Forex Mistakes DVD will help you skip the expensive Forex learning curve and help you become the profitable Forex trader you want to be! That’s cheap considering the amount of money one deadly mistake will cost you! Here’s to avoiding the five deadly Forex mistakes! P.S Order your copy of The Five Deadly Forex Mistakes DVD today and I’ll give you a 14 day money back guarantee. If at any point during that period you feel my DVD can’t help you avoid these expensive mistakes, simply return it and you’ll get a full refund. No questions asked!